Taurus Ascendant: the sign of the Cosmic Artist – Venus! Amy Winehouse was born with Taurus Ascendant and lord of Ascendant Venus is retrograde, placed in the 3rd House with Mars in her Natal Chart. The conjunction of Venus and Mars in Cancer is a good combination as they happen to be the Lords of the Ascendant and the 7th House respectively, which happen to be the Kendra Houses. This union blessed her with the ability to connect well with the outer world and the ability to effectively express her inner self, as the 1st House stands for the 'self' and the 7th House stands for the outer world and the masses. A combination of 2 Kendra lords is considered to be good as it increases the scope of the person being able to project himself/herself to the outer world impressively. Sun in Leo also indicates that she had all the qualities that make for an iconic star! The imperial Sun in the regal sign of Leo in most cases blesses the natives with brilliance and natural talent. This also indicates ingeniousness and originality! The 4th House in Astrology represents the core of our emotions and the point of origin for expression and the nature of this House gives an idea of a person's emotional structure. The concept of an artist is all about expression and presenting the inner ideas to the outer world and what he/she feels from within. The 4th House, thus happens to be a very crucial House in the case of an artist. 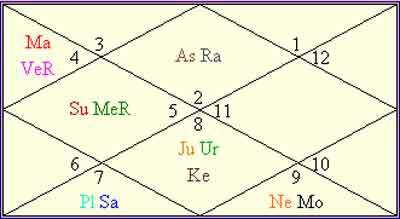 In the case of Amy, Ganesha observes that the 4th House is occupied by the bright Sun and the logical Mercury, that too in the former's own House! There is a beautiful combination of the 4th House and 5th House Lords in the 4th House and this results into a Rajayoga (a combination of Kendra and Trikona Lords) and also the Budh-Aditya Yoga. This can be considered to be an another bright highlight of the Horoscope as the creative master Venus is placed herein with the powerhouse planet Mars. The 3rd House represents a person's skills, hobbies, artistic potential and abilities. The Venus-Mars combination here gives great artistic and creative flourish and it shows that Amy enjoyed spending her energies in making music and writing songs. Mars being the planet of energy, being aligned with Venus in the 3rd House ensured the channelisation of energies into the right path, and the path happens to be art. Mercury happens to be the Lord of the 5th House, and this House happens to the House of performance, innovation and talent and its conjunction with the Sun strongly favoured Amy and her creative pursuits and also ensured that she gained fame and recognition because of them. This is one of the contributory factors for her brilliant song-writing skills, as Mercury represents the power of the word and thinking and its union with the Sun gave her great imaginations depth of thought and a sense of originality. Moon in Capricorn gave her a great professional drive, a clinical approach and an ambitious attitude. It also gave her great pragmatism. Jupiter is in the Sign of Scorpio giving great opportunity for mental and spiritual growth. Jupiter conjunct Uranus indicates that her attitude towards life was positive but she would have been somewhat dreamy and thoughtful. What would have been responsible for such a short span of life and the mysterious death? Ganesha notes that the Moon was placed in the 8th House in the Natal Chart of Amy. This placement indicates suicidal tendencies and higher chances of falling easy prey to depression. Moreover, the placement of Moon in the 8th House is not a very good placement and indicates chances of a short life span. To complement this point, Ganesha observes that the Lord of the 8th House – Jupiter, is placed in the 7th House and he is afflicted due to it being posited in the Ketu-Rahu axis. The association of the Lord of the 8th House with either Rahu or Ketu may result into the native passing away in mysterious circumstances. On the day on which she passed away under mysterious circumstances, Rahu was transiting over her Natal Ketu degreecally. Mars was degreecally transiting over Natal Rahu posited in the Ascendant. Transiting Moon was in degreecal opposition with Natal Saturn. These factors indicate that due to the unfavourable planetary alignment on that day and due to the existent planetary configurations relating to her longevity in the Natal Chart itself, her death took place in an untimely and mysterious circumstances! "Had Amy lived longer, she would have been able to achieve greater heights and higher pinnacles of glory in her career", concludes Ganesha! 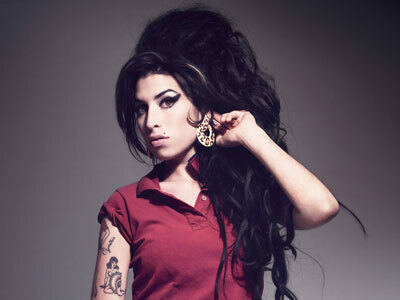 May Amy WineHouse's soul rest in peace and may her glory eternally enchant people!